Hours: Monday - Friday 8:30 a.m. - 6:00 p.m.; Saturday 8:30 a.m. - 4 p.m.
Just like the sign says, Jonathan Embroidery in the garment district sews professional-grade buttonholes while you wait. How fabulous is it that you can get professional buttonholes made in NYC's garment center—while you wait—for $1-$2 per buttonhole. I really don't like making buttonholes. Does anybody? I mean, by the time I put my buttonhole foot on, make a test sample or two, the technicians at Jonathan will have sewn 10 perfect buttonholes. So yes, I am a complete Jonathan Embroidery buttonhole convert, letting them sew all my buttonholes for me, keyhole and regular. You usually don't have to wait long to get your buttonholes made—I'm typically outta there in twenty minutes or less. Do have your buttonholes marked in advance, either with pins, chalk or marker. The only thing left for you to do will be to snip some threads. Now if they could just sew the buttons on for us…. Note: Jonathan's takes cash only; no credit or debit cards accepted. 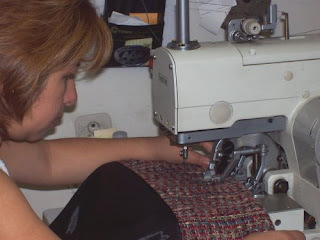 A buttonhole technician preparing to sew buttonholes on a coat I made in 2008. A view of the buttonhole area. Hundreds of thread color options. Jonathan Embroidery has a decent selection of buttons.